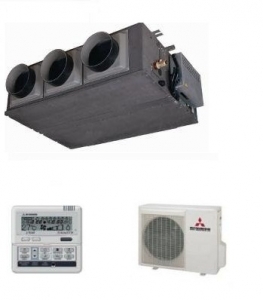 The Mitsubishi FDUM60VF ducted heat pump offers powerful heating and cooling for two to three medium sized rooms. The systems includes the indoor ducted unit, the outdoor heat pump unit and a fully programmable seven day hardwired control unit. This model has three outlet spigots so can be used to heat or cool three bedrooms for instance.